A woman and her young child escaped injury after their north Belfast home was attacked by arsonists. A small fire in the garden of the house was reported to emergency services at 06:05 BST on Saturday. 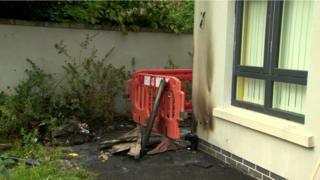 It spread to the side of the house on Ballysillan Avenue, damaging a nearby electric box and gable wall. Police said they believed it was deliberate. DUP councillor Dale Pankhurst said the actions of the woman's neighbours helped avert a tragedy. "The neighbours actually rallied round, knocked the door and made her aware that there was a fire before the alarms went off," he said. "When she awakened, the rooms were filled with smoke. "She went into her young son's bedroom - he's only one year old - the room was filled with smoke and he was quite distraught."